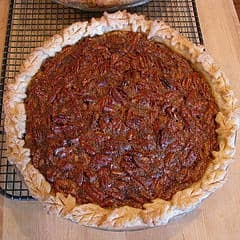 Imagine a pecan pie filled with pecans and chocolate chips. This is a great change over regular chocolate pie. Call over your chocolate lovers for this one! I really like to use the semi sweet chocolate chips when I make this pie, that way, you get the wonderful flavor of chocolate without the pecan pie being too sweet. This chocolate chip pecan pie combines a traditional pecan pie with lots of chocolate. In a mixing bowl, beat eggs, sugar, corn syrup, and vanilla. Add butter and mix well. Stir in pecans and chocolate chips. Pour into pie shell. Bake at 350 degrees for 50 - 55 minutes, or until set. Serve with ice cream if desired.